Is there an end to Sathya SaiBaba’s miracles, that take place in glorious, mysterious ways? Buzz up! A fascinating episode has been recorded in “Sai Baba: Invitation to Glory” by Howard Murphet. 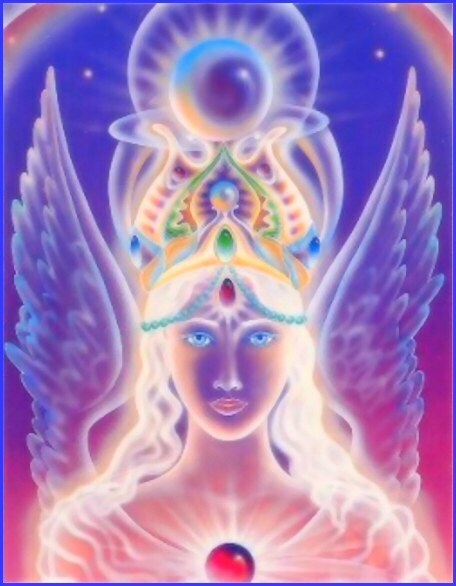 There is no dearth for miracles in a Master’s prescence. Divine alchemy as we may call it, when Jesus Christ turned water to wine at Cana in Galiliee and Mosses turned the river Nile to a stream of blood in Egypt, is still a continuing story as Sathya Sai Baba turns water into petrol. An old Sai devotee was once driving with Baba and others, just after the second World War, through the country side, heading to a religious festival. It so happened that the car car stopped mid way in want of fuel. One of the passengers knew a fuel station down the road but was not sure about the availability of petrol. The driver opted to buy petrol from somewhere nearby but since the availability was the seeming question, Swami asked him to fetch a pail of water from the house that stood less than a hundred meters from them. When the driver returned with the bucket of water, Swami Sathya Baba played his finger on the surface of the water as those who accompanied Him stood watching silently. He then instructed the driver to pour the ‘Water-fuel’ into the petrol tank warning him not spill even a drop. Soon the Swami and the othres began to drive as the car responded to Swami’s miraculous petrol! 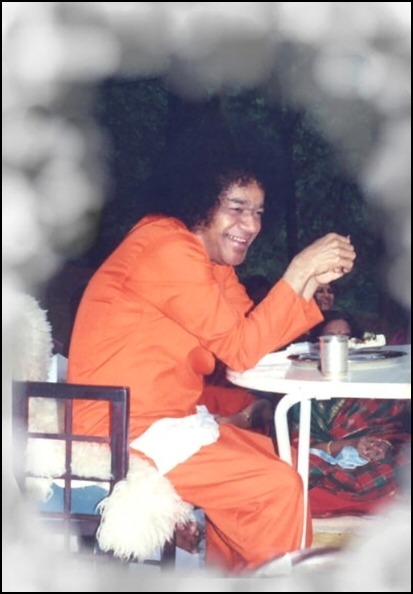 If this achemy could happen in Sathya Sai Baba’s physical presence, there are instances where it could happen in the absence of His bodily presence. The petrol tank of Mr. Gordon Chetty’s car, a nine seater Station Wagon, was always full miraculously! The vehicle was employed in spreading Baba’s teachings irespective of the distance. It happened eleven times in two years. Once Mr. Gordon was in a wedding party when suddenly he was called by someone urgently to attend to the petrol spilling out of the tank. It was always a usual happening that his parked car would have its petrol tank full miraculously, and a little of the fuel overflowing. It was customary of a huge crowd, of over hundreds, watching each such miracle. At this particular happening there were about 800 spectators and twelve people who collected the overflowing petrol for their own use! Is there anything that Grace cannot manifest? Sathya Sai Baba devotees from Kuwait presented a skit entitled ‘Faith & Surrender’, a drama based on the power of Prayer. There is a devout Muslim searching a good match for his daughter. In his daily interactions with the shopkeeper of the local grocery store, he discovers the power of prayer. The episode narrated here is of a very pious but poor lady who begs for food at the store. When the shopkeeper mockingly tells her that he would give her provisions equivalent to the weight of her shopping list, she takes the name of Allah and places the list on the scales. The scales get “tipped” so heavily in favour of the one taking the Lord’s name that no amount of provisions seems to move the weighing balance! With the Lord’s name, nothing is impossible. 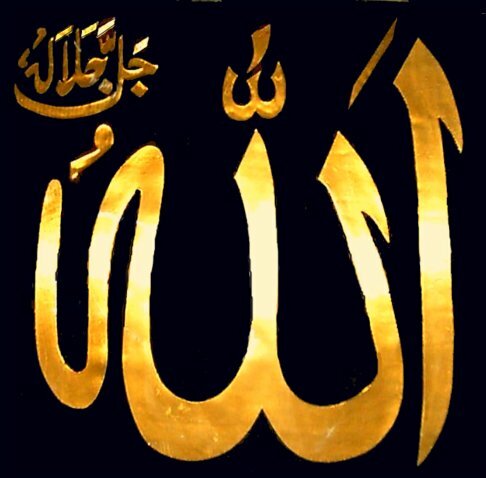 And so with the Lord’s name on his lips, the devout Muslim is able to find a good match for his daughter. That lad is also devout and hardworking and helps a music teacher, Rammohan, to run his music classes. Some years after their wedding, on the holy day of Eid Ul-Fitr, a begger comes to their house and asks for alms. The protagonist argues with his wife that charity comes above family and his wife reluctantly parts with the food. He convinces her that Allah will take care of them and that she should not loose her faith. Before he could complete his sentence, a guest appears with lot of sweets for all of them to celebrate Eid and the wife regrets that she let her motherly anxiety overcome her faith.. Finally, there were simple dances and songs in praise of Bhagawan. 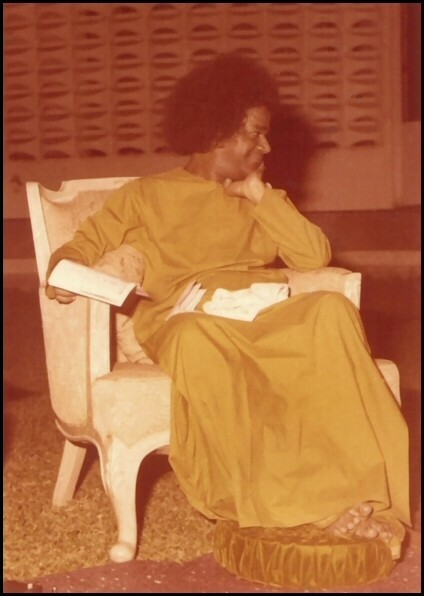 As the programme concluded, Bhagawan called a little girl (one of the children in the story) and materialised a gold chain for her and put it lovingly around her neck. He also blessed them posing for group photographs. Bhagawan then permitted them to sing bhajans. Very creatively and nicely, they sang Bhajans, each threaded into the other. After the singing went on for about 15 minutes, Bhagawan blessed the prasadam to be distributed and then retired after receiving Aarthi. RadioSai: This evening, devotees from Kuwait presented a musical drama and a bhajan medley. They were seated in the centre of Sai Kulwant Hall with their green scarves, with a picture of a mosque as a backdrop when Swami came for darshan. After Bhagawan reached the stage, the programme got underway at 4.50 pm. Children acted out the drama while the songs were sung by the older devotees. Swami came down from the stage to take pictures with the group, and when He returned onstage, the devotees sang Sarva Dharma bhajans in medley style, with no gaps between bhajans. After fifteen minutes of the Bhajan medley, Swami accepted Arati and returned to His residence. WASHINGTON (AFP) — Around three-quarters of Americans believe in miracles, more Americans believe in heaven than in hell, and nearly six in 10 pray every day, a report based on a survey of 35,000 US adults showed Monday. Of those who pray regularly, around a third — 31 percent — say God answers their prayers at least once a month, and one in five Americans said they receive direct answers to prayer requests at least once a week, the report by the Pew Forum on Religion and Public Life said. Seventy-four percent of those surveyed for the report, called the US Religious Landscape Survey, said they believed in heaven as a place where people who have led good lives are rewarded, while only around six in 10 believed in hell, where unrepentant evil-doers languish in eternal punishment. The report reflected the changing face of the US religious landscape and also the diversity of belief among Americans, Pew researchers said. “Once upon a time, belief in heaven and hell were very closely related and in many people’s views were two sides of the same coin,” John Greene, a senior research fellow at Pew, told a telephone news conference. Nearly eight in 10 American adults (79 percent) believe that miracles occur, the survey, conducted between May and August last year, showed. But perhaps most striking in the report was the near unanimous belief in God, held by more than nine out of 10 Americans. “While this survey finds that more than nine in 10 Americans believe in the existence of God or a universal spirit, it also shows that there are considerable differences in the nature of this belief,” Pew research fellow Greg Smith said. “Six in 10 adults believe God is a person with whom people can have a relationship, but one in four, including about half of Jews and Hindus, see God as an impersonal force,” he said. Oddly, one in five of those who identified themselves as atheists in the survey said they believe in God. “It may very well be that they don’t really know what atheist means. It sounds good so they answered it; we call that measurement error,” Greene said. “But this also shows us the complicated way that people think about their faith. Many people who identify as atheists may not be telling us they don’t believe in God, but that they don’t like organized religion,” he said. “In addition to having atheists who say they believe in God, we have people who say they are very committed to a religious tradition but don’t believe in God,” he added. “There is a lot of complexity in American religion,” Greene summarized. The survey also showed that religious affiliation tends to translate into social and political leanings. “Mormons and members of evangelical churches tend to be more conservative in their political ideology, while Jews, Buddhists, Hindus and atheists tend to be more politically liberal than the population overall,” the report says. As the United States gears up to elect a new president in November, that translates to the simple fact that “there are votes to be had by the Democratic and Republican candidates by making appeals to religious groups,” said Greene. Pew issued a first report, based on information gathered in the survey, in February this year. That report, which focussed on the impact of immigrant flows on the religious landscape of the United States, predicted that Protestants would no longer be in the majority in the United States by the middle of this century. “While native-born Protestants outnumber Catholics by two to one, among immigrants, Catholics outnumber Protestants by the same ratio,” Luis Lugo, director of the Pew Forum on Religion and Public Life, said when the first report was released. “So even though immigration is by and large confirming the Christian social nature of the American people, it is helping to tilt the balance towards Catholicism,” he said.